Providing you the best range of fabric applique work services with effective & timely delivery. We can provide our clients a variety of Fabric Applique Work Services, which is designed using premium quality material with intricate cut work. A unique combination of beads and laces can be seen in the design thus making it a treat for the eyes. 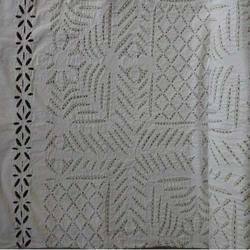 Small beads have been stitched to the organza to silk fabrics with the help of fine threads that are extremely smooth and durable at the same time.